Is Hyperloop more than just loopy hype? This week, US company Hyperloop One announced that it had performed the first ever full-system test of the technology at its Nevada HQ. The run, which took place back in May, saw a sled hitting 70 mph in the company’s 500m ‘DevLoop’ vacuum test track. Company co-founder Shervin Pishevar described it as Hyperloop One’s ‘Kitty Hawk moment’, invoking the spirit of the Wright brothers and their first powered flight over a century ago. But will we ever see a commercial Hyperloop system shooting pods of passengers around the world at 700 mph? Undoubtedly, Orville and Wilbur must have had their detractors back in 1903, even after they reached that important first aviation milestone. However, the first commercial flight took place just over a decade later; an airboat ferrying passengers between Tampa and St Petersburg in Florida. Despite the technological advances we’ve seen over the past 100 years – and the unfettered enthusiasm many have for the concept – one imagines it will take considerably longer before we see a commercial Hyperloop service in action. To begin with, the technical challenges are significantly more complex. Once the aerodynamic principles of powered flight had been established, engineers were able to apply the technology of the day and make reasonably rapid advances. Initially, at least, little infrastructure was required. Rudimentary airports were able to slowly evolve into the modern behemoths we know today, adapting in step with aviation technology. Hyperloop has no such luxury. Where aviation had the open skies as its conduit, Hyperloop has congested land masses through which virtually airless tubes must be constructed and maintained. “Building a sophisticated, evacuated tube system that is elevated on columns and aligned to a standard suitable for 700 mph operation will definitely be a challenge,” said Philippa Oldham, head of Transport and Manufacturing at the Institution of Mechanical Engineers (IMechE). Admittedly, air travel is not without its safety concerns either. But while 35,000 feet is a precarious place for something to go wrong, in many respects it is far removed from a variety of potential harms. To interfere with an aircraft at this height, you would generally have to either be on board or have military weapons at your disposal. Sabotaging a Hyperloop track at ground level would likely be a lot easier, and securing the infrastructure will be a primary concern. The cost of building, maintaining and protecting Hyperloop tracks will almost certainly be astronomical, which is one of the reasons why the Gulf region is at the vanguard. Last year, Hyperloop One signed an agreement with the Dubai Roads and Transport Authority to evaluate the system’s feasibility in the UAE. 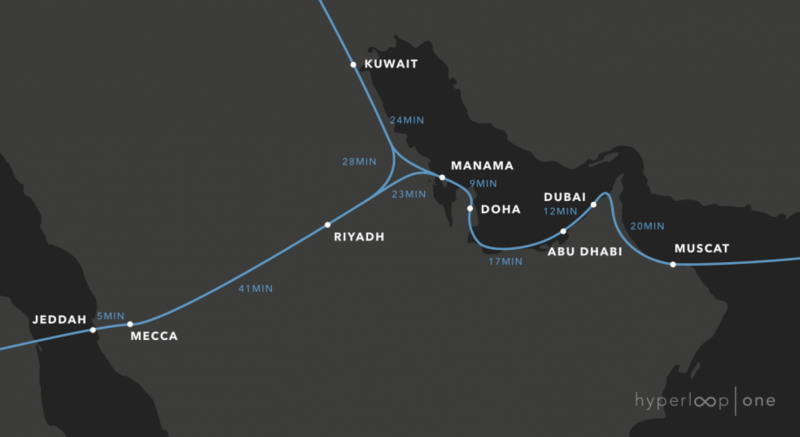 At this year’s Middle East Rail event, wider plans for a Hyperloop system connecting major cities across the Gulf were revealed. The Middle East’s wealth is matched only by its appetite for development, and in many ways the vast tracts of undeveloped land and rapidly growing cities are readymade for a Hyperloop system. Conversely, building it in a region with such political instability could be a recipe for disaster. Regardless, it certainly appears the most likely candidate for the first major implementation. And good luck to them. I’m sceptical about many aspects of Hyperloop, but it is exciting technology with the potential to transform our transport system. Even if we never see a commercial Hyperloop in operation, it is helping to inspire a new wave of young engineers. In February, TU Delft won SpaceX’s Hyperloop Pod Competition, and the Dutch university is now building Europe’s first test track. Closer to home, Edinburgh University’s HypED team has 50 members from multiple disciplines working together to build a half-scale Hyperloop pod. Once complete, it will be tested at SpaceX’s test track in California. The HypED team is keeping a diary of their progress for The Student Engineer, and the first installment can be read here. Although it may be impractical, dangerous, inordinately expensive and probably a bit bonkers, Hyperloop has captured the public’s imagination and is pushing the boundaries of engineering. That, in and of itself, is worth celebrating. I had the mistaken impression that hyper-loop would be enclosed in tunnels. So much the more dangerous, I suspect. I see this as a complete non-starter, since the hurdles are so high, and also the hazards and susceptibility to sabotage. Like HS2, another instance of if something can be done it doesn’t necessarily mean it should be. The gee-whizzers thought maglev (magnetic levitation) technology conceived by Professor Eric Laithwaite in the 1960s would transform rail travel. Friction-free motion could also be achieved using air cushion principles — another 1960s British first — but it hasn’t happened. And both modes are probably more viable than Hyperloop. The train drivers’ union will never allow it anyway. They won’t even let us have driverless trains or even guardless trains. They could not pay me enough to try it, let alone go on a journrey. The initial press-release might have been spotted by some of the third-rate minds who occupy the popular meeja…but how would ‘the public’ even know about such, until, short of a few column inches, they write (invariably wrongly and superficially) it up as a done deal! The blind leading the ‘cor blimey’. This has all the hall marks of technical feasibility (possibly) overtaking desirability and rational economics. The rail sector is littered with the wreckage of “innovations” that were never taken up into mainstream activity. Unless the “innovation” can demonstrate sustained and measurable benefits to users it is effectively short duration novelty. The Hyperloop worries me in relation to failure mode and recovery and issues of changing direction and flow sequences. One can only imagine the japes that will arise when a 700mph vacuum train system is handed over to Network Rail to manage, with Southern Rail running the trains. Not to mention the fact that in order to recoup the development expenses, an egg and cress sandwich on the service is likely to cost over a million pounds. PAF should meet my dear school chum: who had a senior Engineering role at one of the large ‘people carriers’ in the S East of a well known country (this one) who was allegedly the instigator of ‘the wrong type of snow’ comment. LS assures me that he never said it, but when have the ‘meeja’ ever allowed the truth to get in the way of a good story. hyperloop is not reality because it uses the danger way to reach higher speed while other more safety way to arrive the same purpose. We could build one on the South Devon coast…..
OH, Rats! Been there done that – learned not to grease the seals with lard. Brunel would have been proud though.